This universal and agnostic (complicit and evading) position that this puts all of us in is my own entry here into an introduction of Wil Gafney’s lessons on translation. Those of us who are not black (or are melanin-challenged as she refers to us humorously) and who are not women may be more caught up in the systems of white supremacy and of the patriarchy than those who are oppressed by them. 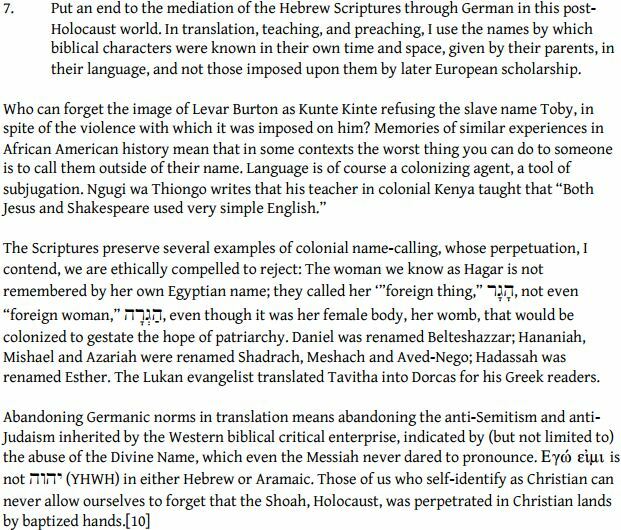 In other words, some of us may not as easily see or hear why translation matters to a black feminist (or a fem/womanist). We with double (and exponentially doubled, white + male and white x male) privilege are not oftentimes willing to listen or to look. While the Police police Ferguson Missouri and Fourney Texas, the “tone police” police facebook and twitter curbing the looters and protesters. We white males do not like the tables turned on us, just as our white colonizing ForeFathers did not like their wigs snatched off. Wil Gafney wonders whether we might imagine Toni Morrison as a Prophet (when many of us priviledged know Moses as Charleton Heston). We can notice how both Gafney and Morrison create a space for new knowledge and the mutual exchange of ideas. Nobody knows the names of the women, enslaved, when translation fails to matter anymore. Something has gone terribly wrong we must all gather. Many have died horrifically most of us can and will willingly acknowledge. And so that’s a start. It’s my starting point for this post. Something most of us will, and can grasp. Second, our tradition of translation may just be complicit with our systems of patriarchy and of white supremacy, and her talk squarely addresses that.